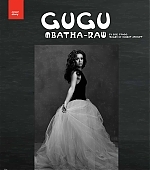 Feature: Gugu Mbatha-Raw for Harper Bazaar! Gugu Mbatha-Raw is high on life. I can hear the smile in her voice when she picks up the phone—her joy bubbles over the line, and it’s wholly warranted. The last seven days marked a frenzy of career highs for the 34-year-old Brit: the surprise Netflix release of her latest film, The Cloverfield Paradox, was the talk of the Super Bowl; she joined the cast of the Edward Norton-directed Motherless Brooklyn alongside Willem Dafoe and Bruce Willis; and she premiered her other Netflix movie, a heartbreaker of a romantic dramedy titled Irreplaceable You, in New York. It’s not difficult to imagine Mbatha-Raw walking in the footsteps of famous thespian dames like Judi Dench, Helen Mirren, and Harriet Walter. She, too, got her start on the stage before establishing herself through starring roles in Amma Asante’s Belle, Gina Prince-Bythewood’s Beyond the Lights, last year’s Disney mega-hit Beauty and the Beast, and a critically-acclaimed, Emmy-winning episode of Black Mirror. 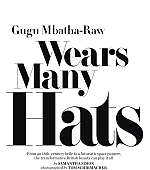 But these triumphs merely set the stage for a year poised to shoot Mbatha-Raw to the highest rung of superstardom. Though critics panned the Julius Onah-directed Cloverfield Paradox, it’s worth a watch for Mbatha-Raw’s performance alone. She commands the screen, no easy feat alongside talents such as David Oyelowo, Daniel Brühl, and Elizabeth Debicki. And that’s merely the start of a string of highly-anticipated projects including the Ava DuVernay-directed A Wrinkle in Time, which is set to claim another box office victory for Mbatha-Raw when it hits theaters March 9. 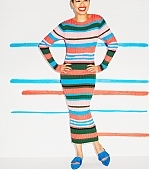 Feature: Gugu Mbatha-Raw for Stylist Magazine! As the entertainment director of Stylist, it’s easy for me to say someone is an important name to know. Someone you should commit to memory and follow their career path because what they are doing is versatile, skilled and barrier-breaking. It’s not often the Queen agrees with me (to my chagrin). But this time the Queen does agree with me, recently awarding Gugu Mbatha-Raw – that aforementioned name to know – with an MBE for services to the arts, an honour she received a few weeks ago at Buckingham Palace: the royal seal of approval in its purest form. 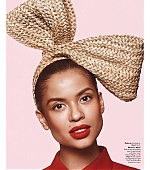 Feature: Gugu Mbatha-Raw for British Vogue! 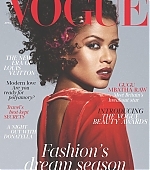 Gugu is on the cover of the April issue of British Vogue! She looks amazing photographed by Mikael Jansson and styled by senior contributing fashion editor Kate Phelan, with hair by Eugene Souleiman and make-up by Hannah Murray, the portrait of Mbatha-Raw wearing Valentino, marks Gugu’s Vogue debate. Check out the photos and digital scans and maek sure to watch the video (under a read more cut because it autoplays). Feature: Gugu Mbatha-Raw for Bustle! For most people, Friday, Feb. 16 was a relatively normal day, if a slightly busier one than usual. The night before, Black Panther hit theaters to much fanfare, and many of us were gearing up for a sunnier-than-normal winter weekend. But for Wrinkle in Time actor Gugu Mbatha-Raw, Feb. 16 had a special meaning. It was the day she decided that after years of standing back and watching everyone else speak up, she wouldn’t — she couldn’t — stay quiet any longer. 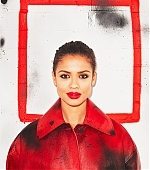 Feature: Gugu Mbatha-Raw for the NY Post! On the dreariest, drizzliest of winter days, Gugu Mbatha-Raw — bundled in a cozy ochre sweater and practical wellies — ducks into a Cobble Hill cafe. As she sits down, the clouds momentarily part, revealing a fleeting patch of blue sky. It’s a fitting entrance for the ebullient actress, whose smart British lilt melts easily into laughter — often at her own expense. The photoshoot video is under cut because it autoplays. But somehow, during a period when the entertainment industry failed to support both people of color and women, Gugu Mbatha-Raw has quietly been breaking barriers for years. She’s a Black woman who managed to escape the expected archetypes, a chameleon who has played everyone from the lead officer on a space mission to a bisexual beachtown party girl to an animated feather duster. A veteran of British television and theater, Mbatha-Raw broke into Hollywood in 2013 as the shy, mixed-race 18th century hero of the movie Belle, and became known for her poised and powerful performances. Since then, she’s starred in nearly a dozen major movies. But it’s 2018 that is finally the year of Gugu: Before the end of March, she will have starred in four films — including Disney’s big-budget, Ava Duvernay-directed adaptation of A Wrinkle In Time. With a huge thanks to Aina for the tip, Gugu is featured in the February issue of Essence magazine. She looks gorgeous in the shoot inspired by her idols Prince, Billie Holliday, Angela Davis, and Cleopatra! Check out the full shoot included in the digital scans and the article. 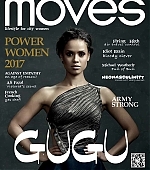 Gugu is on the cover of New York Moves Magazine. She looks amazing! Check out the digital scans, shoot & some outtakes!